In Part 1 of Let the Ghosts Speak, we saw the essential beginnings of a story. Also, we needed to establish an emotional connection between readers and the main character, as described in this post. Now we move on in the story toward the crisis event, which will come in two sequences. Today’s excerpt will show the first. If you have any comments, questions, or suggestions, please post them. When I reached the top of the stairs, I extended my light and pivoted slowly. Bookshelves towered into the darkness. Arranged in rows and columns, the shelves zigzagged here and about, creating a veritable maze of dusty wood, steep ladders, and tattered book spines. Perhaps the keeper of this assemblage understood the logic of the shelf placements, but with no labels to indicate order, the reasons escaped my perception. I walked between two rows and slid a finger along an array of book spines. The candles combined with lightning flashes at the windows to provide enough light. A stroke of luck had put me in English literature, Shakespeare, to be precise. When I came upon Hamlet, I drew the book and tucked it under my arm. On a stormy night like this, trapped for time unknown in a dark, abandoned library, a ghost story seemed appropriate. After finding a bench near a window and removing the mask, I set it, the candelabrum, and the captain’s hat at my side and sat with my back to the storm. The moment I opened the book to page one, lightning flashed, sending a burst of light across the text – ACT I SCENE I: Elsinore. A platform before the castle. Of course I was intimately familiar with the content, having played the role of Polonius in a production that lasted a fortnight. In this environment, however, maybe familiarity would drown in a sea of mystery. Imagination could come to life in the shifting shadows and rumbling thunder. 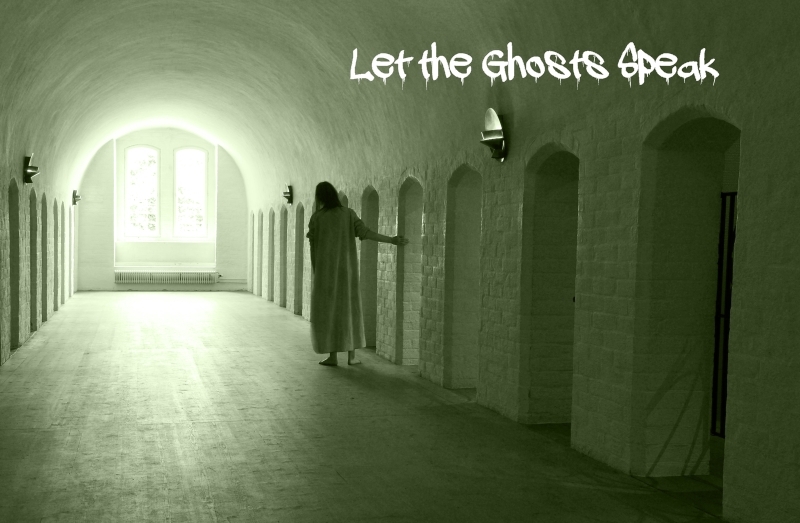 Yes, let the ghosts come forth and speak their minds. I was ready to be entertained by their gloomy fantasies. As I read, the frequent thunder and pelting of raindrops on glass, along with the ongoing violin from below, played a hypnotizing concerto. Whether or not I dozed, I cannot say, but a particularly loud thunderclap snapped me to full wakefulness. From that moment onward, anxiety about the possibility of flooding kept me from slumber. Soon after reading that something was rotten in the state of Denmark, a dull thump shook my attention toward a place unseen beyond the boundaries of the candlelight. A draft ensued and extinguished all but the central taper. Perhaps a window blew open, which could usher in rain, or wet air at the least. Books in that section would not fare well. I set Hamlet on the bench, rose and, carrying the candelabrum, walked toward the source of the sound. With my light only one fifth of its former strength, rendering the floor ahead a dim mystery, I shuffled my feet to avoid tripping. At the same time, I slid the lit candle from its place, hoping to reignite the others, but the flame fell prey to another breeze. Darkness enveloped me. If not for the frequent lightning, I would be lost in a sea of shelves. With each flash, I took note of the distance to a shelf or corner, walked to it, and waited for the next bolt, taking care to make my way toward the mysterious thump. A new sound arose, a sort of mewing. Perhaps a cat had found its way to the open window and took advantage of its good fortune—a dry place to spend the night. Now tracking the cat’s cries, I strode with more confidence that I had found the right path. Yet, as I drew closer, the cries took on a new character, more like whimpering than a cat’s lament. A bright flash lit up the room. Two paces away, a small boy sat with his back to a shelf, sobbing with his hands over his eyes. When darkness again veiled him, I imagined the son of a party guest becoming weary of the inane conversations. He wandered upstairs to seek adventure and became lost in the maze of shelves. Not wanting to startle him with a call, I whistled a nursery-rhyme tune, though I no longer remember its name. A new flash provided another momentary view. The boy was now looking straight at me, trembling, tear tracks evident on his cheeks. How he could see me in the dark was a mystery. Perhaps he was catlike after all. He said nothing. Total darkness blanketed everything. A lightning flash provided a glimpse of his tearful nod. When I imagined leaving this poor, weeping boy alone in the dark, I decided against it. “Better yet, why don’t you come with me?” I reached for his hand but touched only air. Lightning flashed. The boy was gone. Vanished. Cool! I like the continuation. Mr. Davis, thank you for putting this on here. I love reading any formidable author’s works, and this is marvelous. I like the hook, and I recognized all the above things necessary to a story in this piece very easily. I love how it ends in such mystery! I will try and take tips from this fantastic bit. Oh. Well, you could somehow separate characters into groups, make questions dividing them from one another, and then simply make the bios at the end for them saying what story they’re from. I did it similarly with my characters. But, some people don’t enjoy doing this I will grant, so even though I wish it would be done, no one would blame you if you didn’t, because it CAN be time-consuming. No, I don’t have time for that. Sorry.